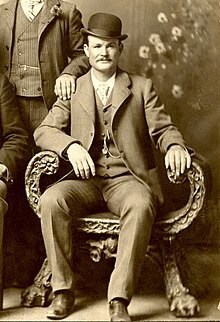 William T. Phillips claimed to have known Butch Cassidy since childhood. 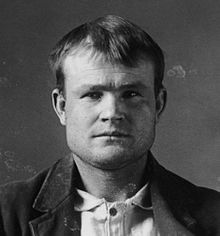 Some have speculated that Phillips was Butch Cassidy, but no evidence supports the claims. ^ a b c d What's Up With All These Names? Bureau of Land Management. 18 January 2008. Accessed 13 June 2008. ^ Armstrong, Jeremy (2008年12月10日). “Outlaw's mum born & bred on Tyneside”. Daily Mirror. オリジナルの2018年11月22日時点によるアーカイブ。. https://web.archive.org/web/20181122051719/https://www.highbeam.com/doc/1G1-190265260.html 2008年12月10日閲覧. "Geordie lass Ann Sinclair Gillies who was born and bred on Tyneside..."
^ The Outlaw Trail. Archived 2008年10月11日, at the Wayback Machine. Bureau of Land Management. 18 January 2008. Accessed 13 June 2008. ^ Betenson, Lula and Flack, Dora, Butch Cassidy, My Brother, Brigham Young University Press, Provo, Utah, 1975. ^ Cody Wyoming: Old West Trail Town, History Archived 2009年10月1日, at the Wayback Machine. ^ Gibson, Elizabeth. "Kid Curry, the Wildest of the Bunch." アーカイブ 2003年12月19日 - ウェイバックマシン WOLA Journal. Spring, 1999. reprinted at HometownAOL.com. ^ The Sundance Kid and Henry Long. SundanceKidHenryLong.com. ^ McPhee, John. Annals of the Former World. 1998. ISBN 0-374-10520-0. p. 358. ^ Patterson, Richard. Butch Cassidy's Surrender Offer. HistoryNet.com. February 2006. Accessed 13 June 2008. ^ a b "Butch Cassidy & The Sundance Kid." Archived 2005年9月20日, at the Wayback Machine. The Mythical West: An Encyclopedia of Legend, Lore, and Popular Culture. 2001. reprinted at OurworldCompuserv.com. ^ Phillips, William T. The Bandit Invincible: The Story of the Outlaw Butch Cassidy Archived 2009年1月15日, at the Wayback Machine.. J. Willard Marriott Library. University of Utah. January 1986. Accessed 13 June 2008.
http://diggingupbutchandsundance.wordpress.com/ Website of articles, chiefly about Butch & Sundance in South America.